Every three months leading up to May 31, 2013, the AOA will unveil a new leg of the osteopathic family road trip. On each leg of the trip, you will be asked to visit the Are We There Yet? portal to complete tasks relating to CME guidelines, certification, and CAP for PQRS. When you have completed the tasks in all legs of the trip, you will be able to enter your name in a prize raffle. 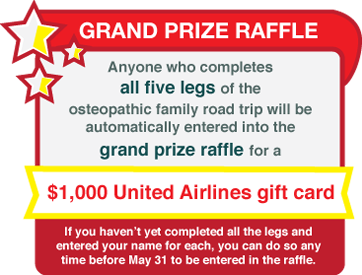 If you complete all the tasks in all legs of the trip and enter your name each time, you will be entered to win the grand prize at the conclusion of the road trip. Winners of each prize will be selected at random and notified via email, telephone or mail. Questions may be directed to arewethereyet@osteopathic.org or (800) 621-1773, ext. 8291. The only way to signify that you have completed a leg of the trip is to submit your name for the prize raffle after you have completed the tasks in the leg. Your name will only be counted once. Winners will be drawn when the subsequent leg of the trip is unveiled. You will not be able to complete a leg of the trip until it is unveiled. There is no penalty for getting a wrong answer. Already completed Leg 1? Click on the next leg of your road trip at the top of the page.